These days many players try to receive these with their backhands, often using a backhand banana flip. And there's nothing wrong with doing that. However, you'll run into problems if you can't also flip return these with your forehand – an opponent might use the same motion and either serve short to the forehand or long to the backhand, and unless you have world-class feet, you aren't going to be covering both with your backhand. So learn to return these shots with your forehand as well, with flips and pushes. The key is stepping in properly. For right-handers, that means stepping in with the right foot as far in as needed. 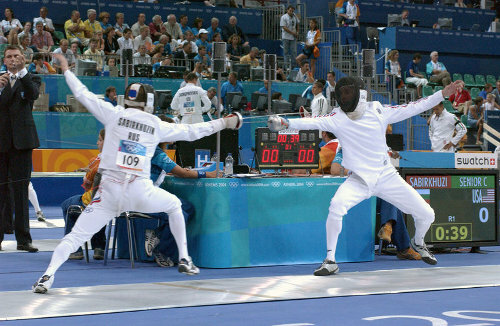 Balance is key, so keep your left arm out in the opposite direction, like a fencer doing an "en garde." Shadow practicing the shot until it's second nature. Perhaps even put a mark on the floor under the table where the right foot should go, and another where it should be in your regular stance, and then move back and forth, while also shadow-stroking a flip or push when you step in. Practicing it with a partner or coach. Have him serve short to your forehand, or you serve short and he drops it short there, and then you can step in to practice the shot. Even better, do it with multiball, where the coach/practice partner alternates one ball short to the forehand (usually backspin or no-spin), another somewhere else (either random, or perhaps long to the backhand). Then do it in game situations. Perhaps play games where both players have to serve short to the forehand, so both get practice on this. Once you have confidence in receiving short balls with the forehand, you can do so either forehand or backhand, depending on the situation. And if you have a good forehand, you'll find that you might even want to receive with the forehand sometimes against short balls to the middle or even backhand, as it puts you in perfect position to follow with a big forehand! I would kind of disagree with you on the stepping in as far as you can. In order to step in the farthest (with your foot) you actually need to lean your upper body back to keep your balance. The foot goes well under the table, but your shoulder (and thus your racket) does not move forward that much. I think what you want to do is step as far under the table as you can while still maintaining (or even increasing) the forward lean in you upper body. I read this "step under as far as you can" idea and tried to follow it. I could never figure out why I had such trouble reaching the short balls until I saw some video of myself. I stepped well under the table, but my head never got over the table. Now I try to lean forward and then step under as far as I can. My foot does not go as far under the table, but now my head is over the table and I have very good reach to get to the short ball. It is kind of a semantics problem. I am sure if a coach had been watching me he would have corrected what I was doing and I would have quickly gone to "stepping in as far as I could while maintaining the right posture". However having only read "step in as far as possible" I was over-stepping and actually keeping myself from reaching the ball because the upper body leaned back. I could be well off base, but this is my impression of what happened in my case. While you do want to step well in to comfortably reach short balls to the forehand, I decided to change "as far in as you can" to "as far in as needed." Hopefully that puts us in agreement! Am I correct in assuming that you do want to maintain the forward lean and get your head over the table? I think I remember you writing something about trying to get the head close to the ball when pushing short balls. The point was that helped prevent "reaching" for the ball and over extending the arm. That would apply in this case also, wouldn't it? Maybe it was not in one of your articles. But the head close to the ball comment was what made me realize how different I looked in my videos from what good players looked like. Not trying to detract from the main point of your tip. When coaching serve return I find myself telling students to "step in more" over and over. So I do realize the importance of your advice. I just need to follow that advice as well as pass it along.